Selected as Party of the Day on March 9th! love! where did you get the cut outs for the pinwheels? 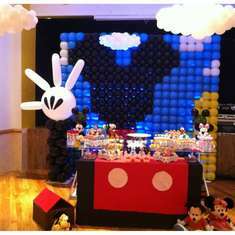 the mickey & pluto, pants, shoes, 'donald' starburst, etc? They are on the Mickey and Friends Cricut Cartridge...Hope that helps you in time for your party. What all props were in your photo booth box? And did you purchase or make them? Where did you purchase the paper fan decorations from? 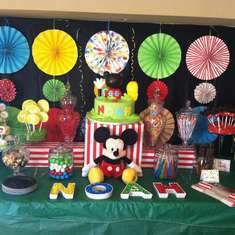 @ Jamila W, The banner with my son's name in the candy table I made with my cricut. 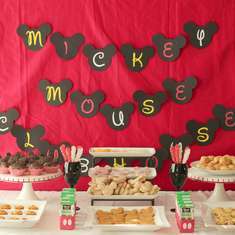 I also have the 2 large party banners with the Mickey Mouse and friends, printed in vinyl and 1 my cousin painted in a canvas... Hope that helps.. Thanks! Where did you purchase the Mickey's @ ? @Brittany B, I got the Mickey's stuff toys @ the Disney Store Website..
also where do u get the big glass jars with the candy in them from?? @ Dana A for the photobooth, I just bought a polka dot fabric, I stapled it against the garage door... I kept it simple.. If you have a flat wall, you can also use gift wrapping paper with designs on them that goes with your party theme and tape it on the wall, just make sure it's matte so it won't reflect the camera flash... The glass jars I got them either Marshalls, TJ Maxx or Home Goods. They have the best deals! Hope it helps.. Let me know if you need anything else. I'll be happy to help.. Thanks..
@KANGELIA B, I made the paper pans/medallion using Martha Stewart scoring board and glue gun. It was a lot of work but very easy to make.. Very cute... I have a scoring board and am going to attempt to make these as well. Did you just use standard cardstock? @ KANGELIA B, yes I used standard cardstock... Have fun crafting!!! Amazing Party! Such great inspiration! Thanks for sharing! 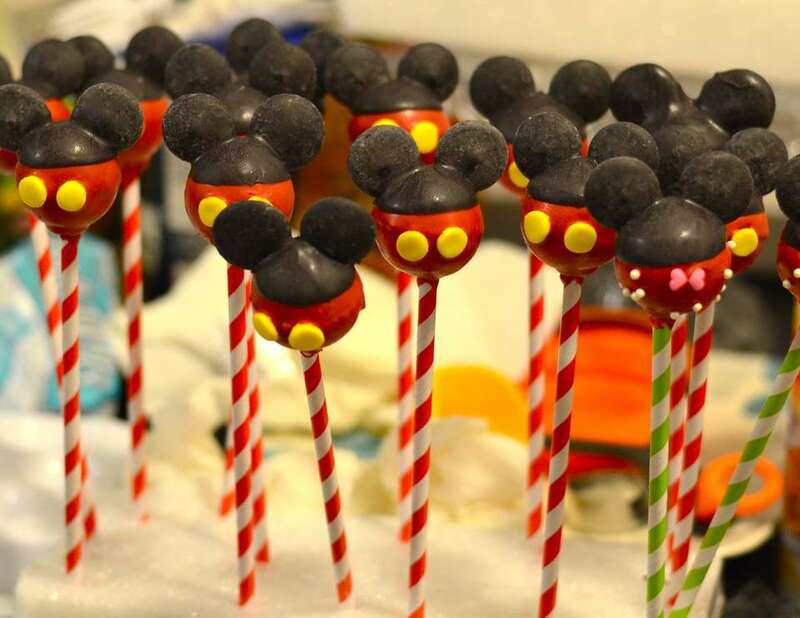 A quick question: how did you make your Mickey inspired cakepops? Is it the same method as the Mickey inspired covered apples? 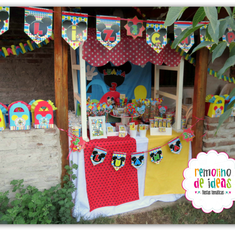 love the party! !1 very cute and simple, how did u make the table centerpieces? The cake pops look amazing! What did you use for the yellow buttons? Hi Anna! How did you manage to keep the black lanterns ( mickey head ) on the red flower pot? I love the signs around the candy jars. Is there a template?